Recently I traveled to the west coast of Florida for a workshop in macro photography with Instructors Mike Matthews and Adam Jones. This was followed by a fun filled three-day birding excursion across central Florida. I got to meet photographers from all over the US and had a wonderful time and learned a few more skills. Macro photography (or photomacrography or macrography, and sometimes macrophotography), is extreme close-up photography, usually of very small subjects, in which the size of the subject in the photograph is greater than life size. In short, I had the opportunity to photograph over 40 varieties of frogs, lizards, chameleons, snakes, toads, and other objects in fine close detail. My favorite frog, the Red-Eyed Tree Frog.. Here is a tale of a tail..chamelion tail that is..
Go ahead and kiss me,,,I will turn into a handsome prince...trust me said the Strawberry toad.. It;s Monday, get to work,,,I don't have to cause I'm a Frog! Can you lick your eyeballs? Green Iguana just lying on a log..
February’s alignment of the planets brought Venus (the bright morning star) and the red planet Mars in close proximity. Saturn was also visible in the predawn hours. Strange? Perhaps. I have been sitting on the dock on the Broward for over four years now. I have learned to be observant and nature has been a wonderful teacher. Friends were there to help me identify some of the rarer birds I have seen. But nothing prepared me for this.. I first noticed it hopping across the lagoon in the late evening light. It was there one minute, then gone. The next day I again caught a glimpse of something odd in the marsh. I have seen a variety of reptiles and amphibians in my time but this was a first for me. That evening it was back, sitting next to the marsh grass, a strange grin on its green face. And it was holding a sign that said “ve ou”! An alien language perhaps or poor French? Yes, it was a strange encounter of the fourth kind. A rare sighting of a balloon faced Valentines frog. One that I will never forget. One for the record books on the Broward. As I looked up from the odd creature below me another strange sight came into view. It was part human and part machine like one of those cyborg creatures. Closer and closer it came, radar type appendages scanned the marsh below. I bet they were tracking the Valentines Frog too. And then it too was gone. But nothing prepared me for the strange prehistoric looking creature that then appeared flying up the marsh right towards me. Its steel blue eye bored a hole in my mind and it came closer and closer. I had to duck to prevent its huge wings from blowing me right off the dock. Then I saw something else strange on the bank. Was it fish or fowl? A catfish or a catbird? I headed for the safety of the house and told the Editor what I had seen. She asked if I had started on the new medical marijuana stuff that Florida voted on. Then I showed her the photos of my strange encounter. She asked if she could have some too!..Blessings.. I had a Snowy Encounter of the Egret kind.. Here fishy fishy...come for your Valentines treat...err,,I mean my Valentines treat.. There is was! A grinning green frog like creature...an encounter from outer space? It was a rare Balloon Faced Valentine Frog.. The prehistoric looking bird nearly blew me off the dock as it blocked the sun.. Strange green eyes followed me as I headed for the safety of the house...Catfish or Catbird? The Snow Moon Rises. The headlines read “PREPARE NOW: MAJOR Snowstorm Incoming, Biggest Snow Totals of the season Possible in Northeast.” Winter Storm Niko becomes a strong “Noreaster”. While folks in the Northeast braced for snow and ice storms it was no picnic on the Broward either. I experienced one of the most fierce "Blizzards" of the decade this week. Howling and blowing in the fierce winds they came. A blizzard of "Snowys" came swirling around the channel and headed straight for me. Wings of white blinded my eyes, the rush from their wings nearly blew my coffee cup from my hand. Undaunted, I grabbed the Doohickey and captured the wonder of the feathered storm about me. After reading this intro, the Editor said something I cannot repeat to gentle ears. Ok, a bunch of Snowy Egrets flew up the channel this week and fully captured my attention. Thus began the blizzard of 17 on the Broward. Snowy Egrets are the smaller of the two white herons found on the Broward this time of year. They have black beaks and happy yellow feet. Their larger cousins, the Great Egret, have just the opposite, a yellow beak and black feet. Lately they have been gathering and following a small group of Hooded Mergansers as they feed in the outgoing tide. They have also pestered poor Broward Bob, the local Little Blue Heron, nearly knocking him off his feet while sitting peacefully on the river bank. Reminded me of the recent riots and politics going on. The full moon of February is known as the Snow Moon...wonder why? The Blizzard of Snowy(s) blow up the Broward and head right towards me..
Blinding wings of white rush towards me..
At the last moment it veers away nearly knocking my coffee cup from my hand..harrowing.. The Snowy Storm continues into the lagoon.. The Blizzard nearly blows Broward Bob, the Little Blue Heron from his spot on the bank.. 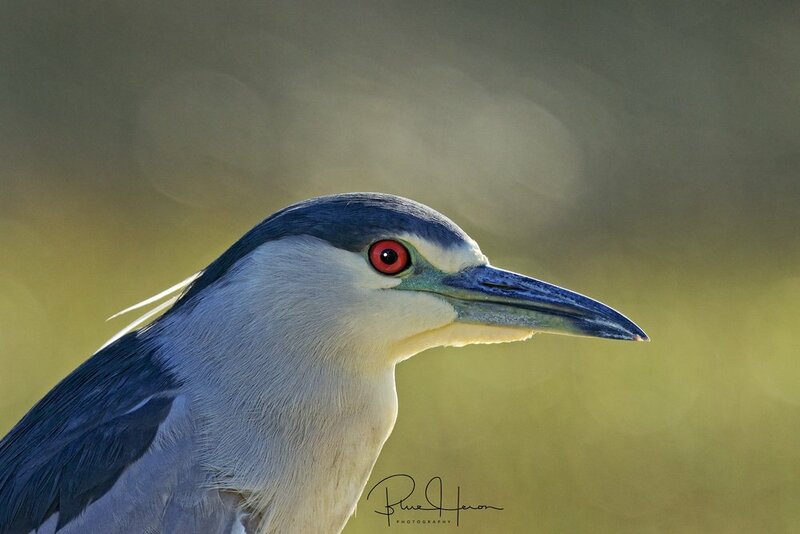 While folks awaited the infamous Punxsutawney Phil’s prognostication for the fate of winter, the local Black-crowned Night Herons also saw a shadow. They could have cared less about the weather. Hard to complain when it is clear skies and nearly 70 degrees. They saw the shadow of something boding much more sinister than cold weather. With a loud raucous squawk, about a half dozen or more Black-crowned Herons simultaneously lifted off from their comfortable roost on the river. I have seen this behavior several times before. Sitting on the neighbor’s dock right next to a jon boat, all I could see was a flurry of wings coming right at me. One landed three feet away on the nose of the boat and just stared at me with its wide red eye full of alarm and fear. Another landed right behind my head on the deck railing while the others scattered into the marsh for safety. I had just observed a high gliding Great Bald Eagle heading up the river. That was not the cause of the commotion however. A large hawk had also appeared gliding over the marsh in slow circles looking for prey. The first step to identifying any hawk is to use its size and shape to decide what you are looking at. Is is one of three main groups: buteo, accipiter, or falcon? Buteos have broad rounded wings and short, wide tails, and you often see them soaring without flapping. This buteo, was larger than our common Red-shouldered Hawk, it was a rather hungry looking Red-tailed Hawk. These hawks have many local/geographic color variations depending on where you are, some darker, some lighter. This Red-tail was the "light morph" variety. The hawk took no notice of the frightened herons and continued its circular hunt for much easier prey. If it were here last week I would have gladly given it a fat rat dinner. Regardless of ole "Phil's prognostication", I can say without doubt that winter will be short in Florida. In fact those brutal three days that dipped into the 30s in January seem to be about it. According to one post, the Palm Trees saw their shadow and predicted 12 more months of great Florida weather. Be Blessed. An Eagle soars overhead blocking the sun.. Dark shadows in the sky as a crow sweeps by..
A buteo with its broad curved wings and short wide tail circles the Broward..
A Red-tailed Hawk searches for prey on this February day..
Light chases away the shadows...here comes the Snowy!